According to our data, Lexington, Kentucky is the most e-literate city in America. Congratulations, nerds! Recently, a new form of reading elitism has come about: judgement against people who haven't yet switched from paper books to digital ones. Even I will confess to patronizingly acting surprised when encountering someone who still reads using the "dead tree format." If the self-appointed "elite" members of society avidly read, then the "elite of the elite" must avidly e-read, right? Who are these people and where do they live? That city must surely be the most elite and cultured city in America. As a company based in San Francisco, we naturally assumed that the most literate, cultured and forward-thinking people live here. Of course there are philistines who prefer less cerebral pastimes, but they probably live in unseemly places like the South, Midwest, and Portland. It turns out all of our preconceived notions about e-reader adoption was wrong. When you dig into the data about where Kindles are actually bought and sold, the most "cosmopolitan" cities in America are soundly beaten by mid-sized cities in the Midwest and South. Moreover, our data suggests that dedicated e-readers aren't very popular devices anywhere. In the landscape of consumer electronics, e-readers barely register. To identify the most electronically literate places in America, we analyzed the Priceonomics database of eight million electronics for sale by city. 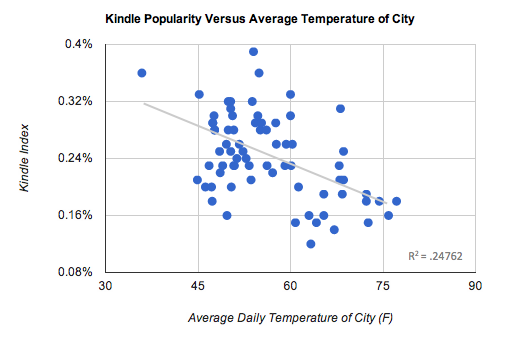 We examined how prevalent the Amazon Kindle was by city to rank how popular e-reading was across the nation (we also examined Nook sales, which didn't change the results). 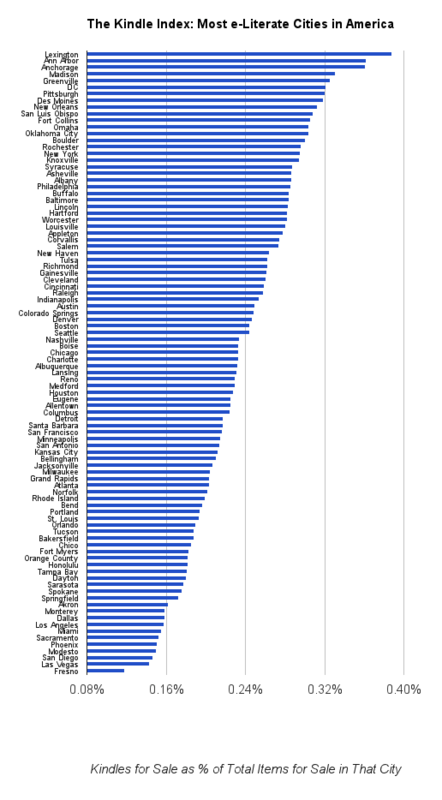 To our surprise, the most populous and culturally-reputed cities in America did not rank among the most digitally literate. Lexington, Kentucky is the most e-literate city in America. On its heels are Ann Arbor, Michigan and Anchorage, Alaska. Congratulations, nerds! Major metropolitan cities like San Francisco, Seattle, Miami, Chicago and LA get crushed in these rankings. 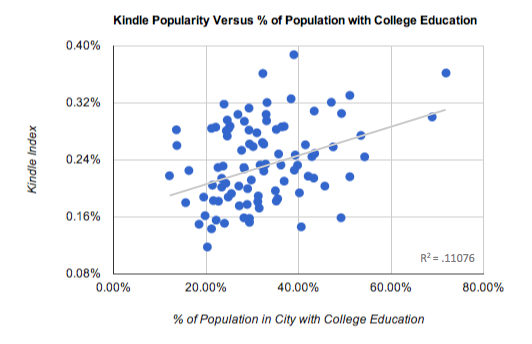 College towns like Lexington, Madison and Ann Arbor fare the best in Kindle ownership. Fresno, CA is the most digitally illiterate city in America. We are very disappointed in you. Same goes for Las Vegas and San Diego where a commitment to reading books on electronic devices is noticeably absent. We couldn't help but notice that the Kindle was least popular in places with the best weather. Is there any truth to the hypothesis that more educated people tend to use e-reading devices? Our data found only a very weak correlation between Kindle prevalence and the percent of the population that was college educated. Ultimately, what stood out to us the most was that the Kindle actually wasn't very popular on secondary markets. Given the amount of marketing and press that brand receives, the product barely registers on secondary markets. 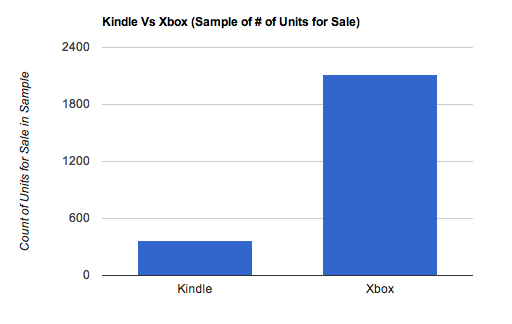 For example, at any given time there are 6 times more Xbox's available for sale than Kindles. 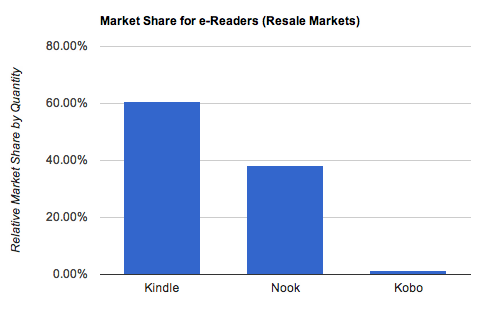 For whatever reason, Kindles just aren't that popular on secondary markets. Is it because they're already cheap, new models come out frequently, or are they just not that popular? It's an open question for now. 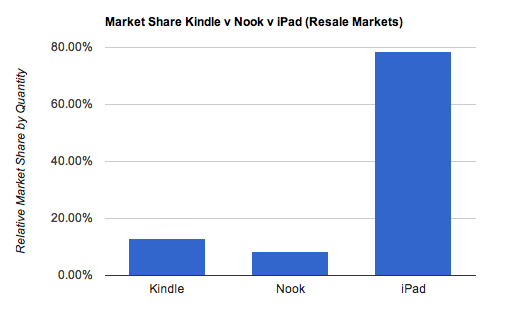 Kindles and Nooks aren't really competing against each other so much as both of them are holding on for dear life versus the iPad. From Apple's perspective, the entire e-reader market looks like a rounding error. John Walkenbach has an amazing insight on his blog about the price of a new Kindle over time. We're recreating it below, and comparing it to the price of an entry level iPad. Astoundingly, the price of new Kindle is inexorably falling to zero. 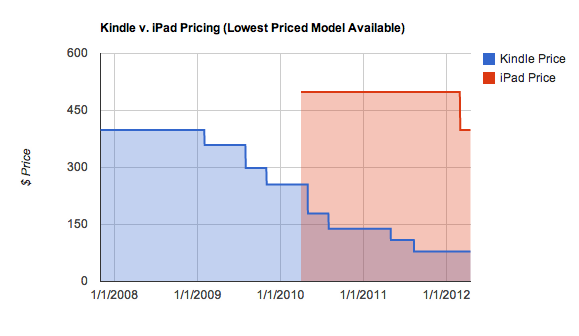 At the same time, the least expensive iPad has stayed at $499 until recently when a $399 model became available. On the other hand, Apple's ability to dominate market share while barely flinching on price seems enviable. In Frighteningly Ambitious Startup Ideas, Paul Graham wrote, "One of my tricks for generating startup ideas is to imagine the ways in which we'll seem backward to future generations." By this heuristic, it seems likely that paper books will be 100% replaced by e-books. At the onset, we assumed that cities like New York and San Francisco would be leading this charge into the future, but we were wrong. Instead, it's the college towns and and mid-sized cities that are the vanguards of e-reading. Even still, dedicated e-reading devices aren't even that popular despite their head start in the market versus the iPad. If the future of reading is electronic, it may well be completely dominated by Apple. This article originally appeared on the blog of Priceonomics, a sale and resale database start-up co-founded by the author.